Thanks to two nice tests with Blind Date at the Austrian State Championships in Steyr, I took my 13th title in a row. For "Beate" it was the second success at the Championships at national level, after also winning in 2014. The basis of our success rested on 74.94 percent in the Grand Prix and then 78.55 percent in the Freestyle. In spite of the suddenly rather warm weather, Blind Date was extremely motivated and showed herself from her best side. A small error cost us some points but I was very satisfied with Beate because she obviously maintained her form since the European Championships. Self-assured movements and very expressive, we now have 20 victories at Grand Prix level and, not too long ago, we took tenth place in the EC Grand Prix of Aachen. Thank you Beate!! I was also delighted that my team colleague, Astrid Neumayer, won silver on her Rodigruez, who made his championship debut at the EC this year and also competed in the State Championships for the first time in the general class - and that Katharina Wünschek took bronze Amüsant OLD in her first Grand Prix Freestyle. 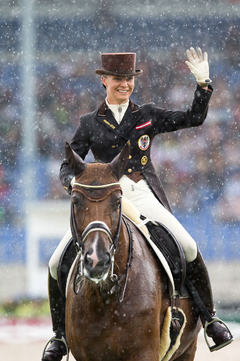 I would also like to take this opportunity to thank the Riding Club Steyr. Valerie Hack, who was responsible for organization, and her team really did a great job and not only made sure that we had the best conditions and that everything ran smoothly but also put her whole heart into everything. The wonderful atmosphere in Steyr was thanks to her tireless effort. We'll be glad to come again!